Marketing analysts are hired by companies to analyze the trends of the competitor and the buying behaviour of the consumers and offer feedback accordingly to the company in order to plan and execute marketing strategies accordingly. The decision to hire a marketing analyst is something that is taken with a lot of caution as they play a very important role on the success of the company. The main job of a marketing analyst involves using multiple tools for the purpose of strategizing their work. With the help of these tools, they collect important information with respect to the target market and competitors. If you are a marketing analyst and are looking for a job, it is very important that your resume is capable of reflecting your qualifications and experience in this field. Creative marketing analyst resume template can be a great help here. No matter what particular industry you are interested in, there are many different types of marketing analysts available here to help you save the time and energy that you’d be required to spend while starting from scratch. Our website has a wide range of marketing analyst Resume Template and cover letter templates that can always be of great use in the field of marketing. These templates come in different styles and formats and can always come in handy as they are easy to use and understand which would save a lot of time for you. They are present in high resolution and great quality which can leave an impression. These templates come in fine print for perfection and brilliance. You can download and print these templates from our website in PSD format. As the name suggests, this type of template lists your work experience in a chronological order with your most recent job experience as the first entry under experience. Previous experience is a decisive factor as it allows the potential employer to understand the companies with whom you have worked in the past, the duration for which you’ve worked, responsibilities that you’ve handled, etc. This template is highly recommended for professionals who have a steady progression in their job to display to a potential employer and don’t have a lot of gap between employments. This type of template is highly recommended for professionals whose job history is non-traditional, has large gaps between employments or are looking for a career change. Rather than a chronological order, this type of template would either feature a highlights section or accomplishments after the description or summary. This accomplishment section will talk about your success and qualification in detail rather than your experience and will talk about previous employers and the positions that you held in the respective organization. 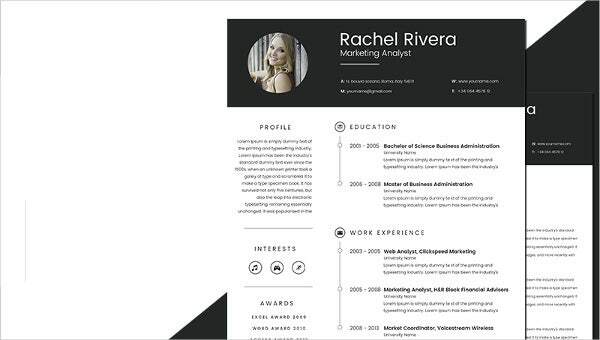 This type of resume template for marketing analysts is a combination of both chronological and functional templates. This can be used by professionals who want to show their steady progression in the field as well as the roles they played in different organizations along with their past achievements. It can also be used by professionals who have a non-traditional job history but have some relevant experience in the field. This too is an excellent option for impressing a potential employer. As you can see in the samples, these resumes look very neat as compared to a standard resume. As you might already know, the way in which your resume is presented talks a lot about your professional behaviour and thus it is very important to take your best foot forward. You simply need to fill in the fields, add a picture of you, write about your qualifications, experience and achievements and you’ll be done. They are editable and you can easily edit any field, remove them or add a new one. 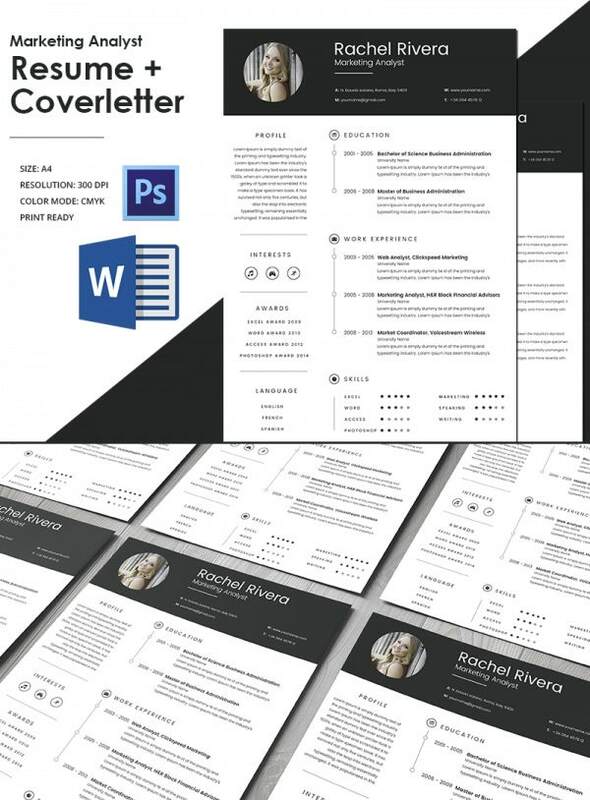 These professional marketing analyst resume template with cover letter are available in PDF and Word format and as mentioned above, can be completely edited. They are print ready, customizable and all you need to do is to fill your information and print them. These templates will allow you to make a far better impression on the employer as compared to a standard resume and will thus improve your chances of bagging the job.